I recently discovered that Halloumi sales are higher in the United Kingdom than anywhere else in Europe. We adore this Cypriot non-melting cheese so much that a pop-up in Camden recently started selling Halloumi Fries (which look delicious, by the way). This simple, easy salad combines the classic combination of melon and ham with that extra, buttery punch of halloumi. 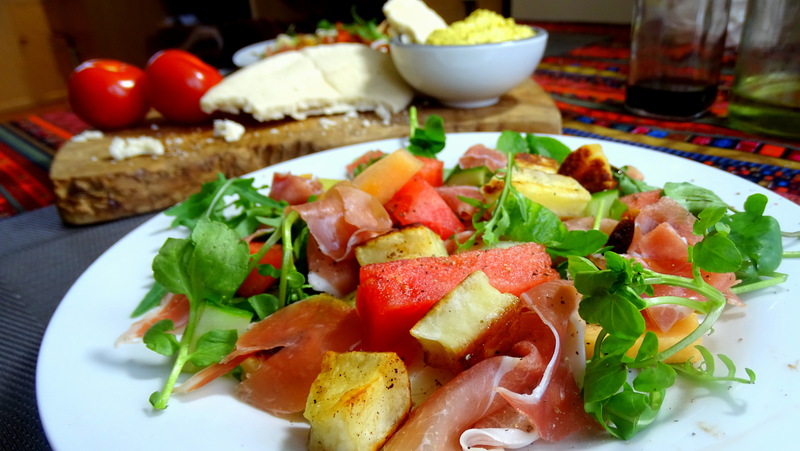 This is less a recipe, more an idea for a collection of truly beautiful flavours – the mild sweetness of melon, creamy-salty halloumi and cured aromatic prosciutto. Melons – honeydew, watermelon, cantaloupe, cut to various sizes (small cubes, wedges, slices). (Optional) Grill/fry the halloumi until slightly browned. This is best served immediately, as the halloumi gets rather tough when allowed to cool after cooking. Tear your pancetta and loosely arrange on the plate with the melons, a handful of rocket and a few pieces of cucumber. Try not to arrange too precisely, you want a nice variety of flavour and texture combinations. 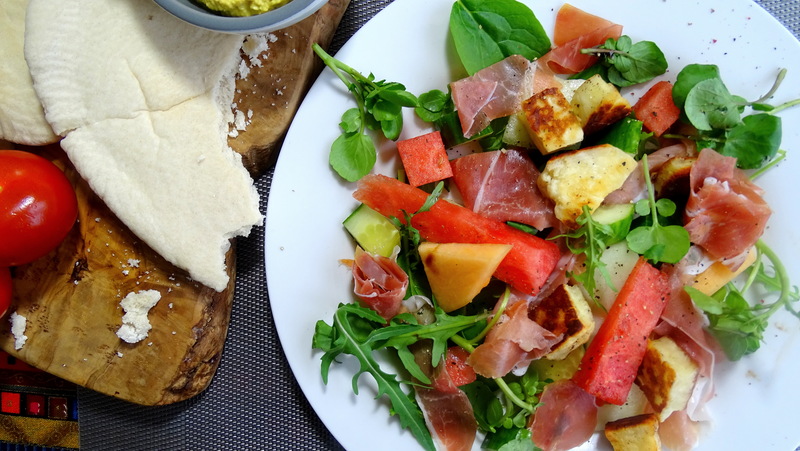 Posted in Guesscipes, Mains, One Pot, Pork, Sides and Snacks, StartersTagged cantaloupe, cheese, food, guesscipe, halloumi, ham, healthy, honeydew, mediterranean, melon, Moroccan, prosciutto, recipe, salad, starter, watermelonBookmark the permalink.